Measuring a scant 4 inches wide by 8.25 inches long by 2.75 inches tall, the Twin 10G SFP+ 10GbE adapter is small enough to sit on most any work surface, but large enough to support adequate airflow inside the case and enable its temperature-controlled, variable-speed fan to keep the adapter running cool and whisper-quiet, and reliably at all times. Constructed of rugged and lightweight aluminum, the outer shell securely protects the inner circuitry. Setup is easy—connect the Twin 10G SFP+ 10GbE adapter to the host computer via the included Thunderbolt cable, download and install a driver, connect the adapter to the switch or device’s 10GbE ports via LC fiber optic cables (SFP+ transceivers and fiber optic cables sold separately), or SFP+ direct-attach copper cables (sold separately), and then configure the adapter through the OS X® Network control panel or Windows Device Manager. The second Thunderbolt 2 port supports daisy chaining, supporting the connection of up to six devices to a single port on the host computer. This Sonnet adapter’s increased throughput performance and low host-CPU utilization are achieved with functions such as support for flow control support, 64-bit address support for systems using more than 4GB of physical memory; and stateless offloads such as TCP, UDP and IPv4 checksum offloading, enabling your computer to perform better while large files transfers or high I/O operations take place. With its dual ports, the Sonnet adapter supports transparent failover to keep your computer connected in case a single cable is disconnected or one of the ports fails, and it also supports link aggregation(1) for increased throughput! 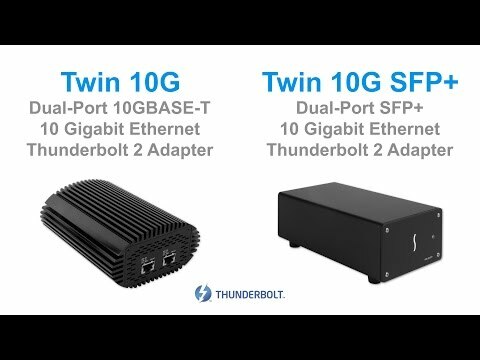 Sonnet includes a Thunderbolt cable to connect the Twin 10G SFP+ 10GbE adapter to your computer, and a ThunderLok Thunderbolt connector retainer clip(2) to secure the cable to the Twin 10G adapter. Thunderbolt connectors are held in place by friction, which works well in situations where equipment remains undisturbed while operating. But when there’s a chance of movement nearby, there’s a chance the Thunderbolt cable can be unintentionally unplugged, possibly leading to loss of your work or data. Sonnet’s ThunderLok prevents accidental cable disconnections from the Echo chassis, and is easy to install and use—just slide it over one end of the cable, and then plug in the connector and secure it to the chassis by turning a thumbscrew. Because of its unique design, ThunderLok does not attach to the connector, but remains on the cable so it won’t get lost when not in use.